Pit bulls are strong, stocky dogs known for loyalty, obedience and a potentially dangerous bite. 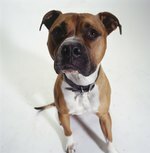 Bites from a pit bull can be deadly, especially for children, and even dogs that are well-cared for have bitten people. Also, pit bulls are often used in illegal dogfighting rings, where they are mistreated to make them aggressive and dangerous. All dogs older than 7 months must be licensed annually in New Jersey. To get a license, the dog must be up-to-date on vaccinations against rabies. At the time of publication, communities get to set their own dog licensing fees, but the state has set the annual maximum fee at $21. Additionally, dog owners were required to pay fees of up to $4.20, at time of publication, that go toward rabies programs and animal population control programs. New Jersey's state laws prohibit banning specific breeds of dogs, though some communities in the state attempt to ban pit bulls in local laws. Court rulings have voided some of these city laws for conflicting with state law. 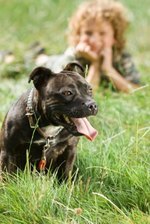 Instead of an outright ban on pit bulls, New Jersey enacted the New Jersey Vicious and Potentially Dangerous Dog Act, which details how to handle dogs who are proven to be potentially dangerous. If a dog of any breed is proven to be potentially dangerous, there are several requirements in place to protect the public from the dog. To be considered potentially dangerous, it must be proved that the dog attacked someone without provocation, killed another animal, posed a serious threat to a person or was trained to attack other people or animals. The owner of a potentially dangerous dog must obtain a special license and red identification tag for the dog, tattoo a registration number on the dog, post a warning sign on the property, maintain a secure enclosure for the dog and muzzle the animal when outside of the enclosure. An owner may appeal the decision to the state's Superior Court. In addition to licensing costs, a dog owner is liable for damages if their dog bites another person, regardless of whether the dog is considered potentially dangerous. However, a dog owner may be required to maintain liability insurance on the dog if a dog is determined to be potentially dangerous. The amount of insurance is established by the municipality in which the dog lives.